Another U.S. Embassy worker stationed in Havana has been afflicted by a mysterious health ailment that has affected at least two dozen other diplomatic workers and family members in Cuba since late 2016, the State Department said this week. 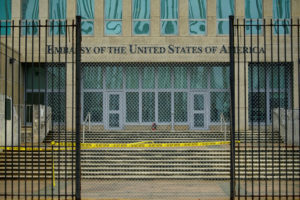 The individual, whose symptoms were medically confirmed by the State Department, was one of two government workers evacuated from the U.S. Embassy in Havana earlier this month to be screened for possible brain injuries, which the State Department believes are linked to “specific attacks” on its workers and their families. The other worker is still being evaluated, State Department spokeswoman Heather Nauert said at a Thursday news briefing. It’s still unclear what (or who) exactly is behind the illnesses or if a sound is even the cause. The mysterious illnesses, often reported along with unusual sounds and vibrations, have puzzled investigators for nearly two years — not just in Cuba, but also in China, where “a number” of U.S. government employees were pulled from the southern Chinese city of Guangzhou this spring over similar concerns. In both cases, it’s still unclear what (or who) exactly is behind the illnesses or if a sound is even the cause. Here’s what we know about what happened in Cuba and China, and what’s next. When did the illnesses start? Since December 2016, 25 U.S. Embassy personnel and their families in Havana have reported hearing strange, high-pitched sounds, followed by an array of symptoms including hearing loss, nausea, vertigo and trouble focusing. U.S. officials initially told the Associated Press that doctors found perceptible changes in affected individuals’ brains. But in the subsequent report, doctors at the University of Pennsylvania — who are evaluating and treating the patients — said they did not find definitive neurological damage via brain imaging. What actions did the U.S. take? The situation has roiled relations with Cuba. President Donald Trump initially blamed Cuba for the attacks, but the State Department contradicted him in a cable sent to U.S. diplomatic posts overseas stating that it had “not assigned blame to the Government of Cuba,” the Associated Press reported. What about what’s happening in China? File Photo by Alex Wroblewski/Getty Images. The incidents in China were first reported last month by a consulate employee in Guangzhou, who described experiencing dizziness, headaches and an inability to concentrate, among other symptoms, after perceiving “subtle and vague, but abnormal, sensations of sound and pressure,” the State Department said. Mark Lenzi, an engineering security officer at the American Consulate in Guangzhou, is the latest of several American employees brought back to the U.S. to be medically evaluated, The New York Times reported. Lenzi said that the first employee was evacuated in April and that he and his family left this month. Lenzi said over the past year he and his wife experienced headaches, sleeplessness and nausea after hearing odd sounds on several occasions. Lenzi described the noise to the Washington Post as “marbles bouncing and hitting a floor, then rolling on an incline with a static sound.” Lenzi and his family had been living in the same apartment tower as the officer evacuated in April. Along with the evacuations, the State Department sent a medical team to Guangzhou to offer “voluntary medical screenings” to American diplomats and family members. 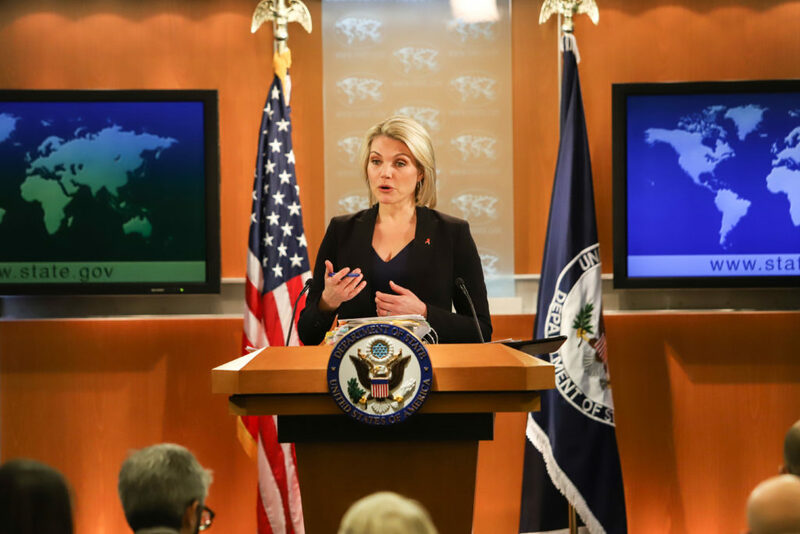 “The State Department has been and will continue to be diligent and transparent in its response to our employees’ concerns,” Nauert said. A State Department spokesperson said that U.S. officials would continue to work with the Chinese government “to look into this situation.” “The Chinese government has assured us they are also investigating and taking appropriate measures,” it added. Then-Secretary of State Rex Tillerson said in December that what occurred in Cuba were “targeted attacks,” but now, officials are less sure. Initially, U.S. investigators believed embassy staff in Havana had been attacked with a sonic weapon, but in a January interim report the FBI cast doubt on the theory that sound waves caused the injuries, the Associated Press reported. A Senate hearing on the matter in January yielded little clarity. State Department officials disagreed with the FBI’s assessment and said at the hearing that then-Secretary Tillerson would be forming an Accountability Review Board to examine the situation. One official told the committee that it was too early to rule out a viral attack. While the cause of these incidents have mystified investigators, researchers have taken their own swings at possible explanations. A team of computer science and engineering professors reverse engineered the potentially damaging decibels using a recording of the high-pitched, metallic noise, released by the Associated Press. The resulting report, published in March by the University of Michigan, found that while humans cannot hear ultrasonic tones, they can hear the byproduct of multiple ultrasonic tones. One theory from the researchers was that ultrasound from a pair of covert eavesdropping devices too close to one another ironically could have inadvertently created the strange noise. While the term “sonic attack” has been thrown around, there still is no known evidence that what occurred in Cuba and China were actual attacks by any person, organization or state. But can sound waves cause the kind of symptoms that the Americans experienced in Cuba and China? The report noted that little is known about airborne ultrasonic waves causing neurological damage, but that there has been correlation. Some research describes workers experiencing subjective symptoms of hearing loss, headaches, nausea, and cognitive difficulties — but only when exposed to high intensity ultrasound. But a March editorial in JAMA by two American doctors said that it’s unclear whether high-intensity sound, either audible or inaudible, can induce long-lasting problems for the central nervous system. The editorial also proposed “mass psychogenic illness” — symptoms created by the social influences, including media coverage of the incident, as well as anxiety, stress and other emotions — as a possible cause of the victims’ condition. They also noted that a lack of information on the individuals — no control group, non-blinded examiners and patient self-reporting — all could have impacted the results of the screening process in the original JAMA report. Havana agreed. A panel of Cuban scientists said in December that the illnesses were likely psychogenic and the sounds closely resembled the noisy chirps of Jamaican field crickets common in Cuba. While the term “sonic attack” has been thrown around, there still is no known evidence that what occurred in Cuba and China were actual attacks by any person, organization or state. It’s also possible that the mysterious accompanying sounds did not cause any harm and are a byproduct of another mode of attack altogether. “The interagency community continues to work diligently to determine the cause of the symptoms, as well as develop mitigation measures,” Nauert said Thursday. Eight of the U.S. diplomats and their relatives who fell ill in Cuba have hired a lawyer within the past two months out of concern over how the government will handle their future medical care, the Miami Herald reported Wednesday. “Are they being treated or are they being studied? It’s not entirely clear what is happening,” the lawyer told the newspaper. What happens to U.S.-Cuba relations amid mysterious attacks on diplomats?